For AT&T U-verse subscribers, finding the best router for ATT Uverse was quite a challenge. Even though there are many routers that are compatible with the ISP, the rentals that were provided, according to our readers, were outdated gateways that were not updated as the speed tiers were increased. Let’s face it, unless all you have is one desktop and you don’t mind sitting in that one room with your router to do basic online activities, you would really want to upgrade your router. AT&T U-verse is not known for their state-of-the-art gateways or their amazing interface. 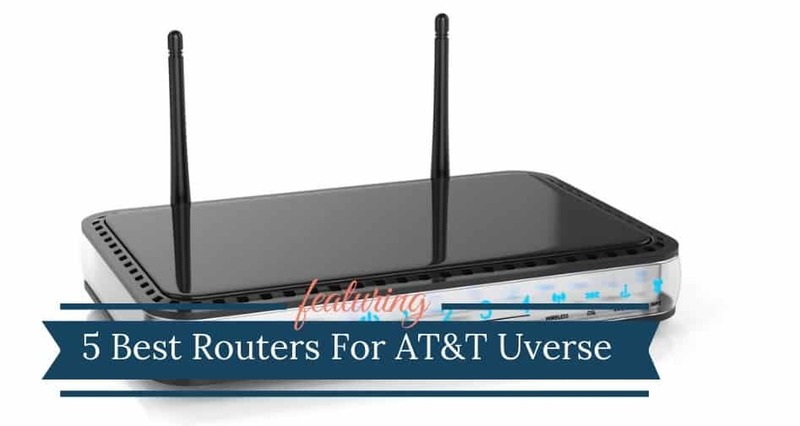 You can surely do better, which is why BlueGadgetTooth researched and reviewed a whole bunch of routers so you can finally sit back and relax, with access to all the benefits of having the best router for AT&T U-verse, if you pick any one of the routers in this guide. Also, heads up. The modem they supply you with has an inbuilt router. However, it is rather lame – only working on the 802.11N wireless standard on the 2.4GHz band. If you are asking yourself on why you are paying for higher speeds while using an outdated router for AT&T U-verse, read on. Our gadgets have evolved quickly, and now you can do most online activities while on your mobile devices. With most individuals and families having multiple devices for each person, the load has increased. Online activities from multi-devices can slow down your network. Getting the best router for ATT Uverse will allow you to access higher internet speeds – with routers reaching theoretical speeds of up to 1Gbps. Newer routers will also allow device prioritization on your network. Obstacles and household gadgets provide constant interference with the network. There are many devices that operate on the 2.4Hz frequency, which can affect the signal strength in your home. Updated routers can easily cover dead spots and extend the range within your living space. Security is a major concern, especially for those who have confidential data online, have kids who can access the internet and financial transactions that should be kept private. Getting your own wireless router for AT&T U-verse will give you access to advanced settings and offer more control over your router, which a rental will not allow. In order to use your own router with AT&T U-verse, you first need to make sure that the router is compatible with the AT&T modem. AT&T requires you to use their DSL modem with WiFi. Step 1: You need to start by plugging in your new router to the power source, and the DSL line. Step 2: Connect the router to the device via an Ethernet cable and ensure that it is Dynamic IP, not Static. (If you are confused about this, you can refer to the manual that comes with the router.) Run your Ethernet cable from the Broadband port on the new router, which could be a WAN or internet port to one of the LAN ports on the back of your router. Step 3: On your computer, open a browser and enter 192.168.1.254 to access the modem’s settings. Go to the Home Network link, look at Status at a Glance, and then click the disable button. You will need to confirm that you do want to disable the built-in wireless router. Step 4: Go to Local Devices and locate the new router. Click on the Edit firewall settings. Select your router from a drop down menu that appears under the ‘Select a computer’ tab. Next, click on the setting that allows all applications, which will switch you into DMZplus mode. Step 5: Return to the home screen, shut the browser you were on and remove the Ethernet cable from your device. Power on your router and check if you can see the wireless signal. Once you have done this, you should be able to access this router from a wireless device and adjust the settings to meet your needs. The Editor’s Choice for the best router for AT&T U-verse is the Netgear R7000 Nighthawk because of its stability, performance while having all the features you would need for a damn good router. ​The sleek black design of the R7000 Nighthawk is almost standard of Netgear’s routers, with a three antennae set up. The antennae help improve the direction the signal travels throughout your home. It comes with 4 Ethernet ports and both a USB 2.0 and a USB 3.0 port, so you will have no issue hardwiring any devices in. The Netgear R7000 can reach speeds up to 1900 Mbps, which means your speed will get a real boost throughout your house. The high-powered amplifiers, external antennas, and the Beamforming technology all work together to give you more coverage by up to 100%. In fact, the BlueGadgetTooth team noticed a significant bump in speeds as well as coverage in areas which previously has inadequate signal coverage. The R7000 also has a Dynamic QoS to prioritize streaming and gaming, preventing buffering and making sure you do not get put on the bottom of priorities if another devices logs in for streaming. This clearly came into play when seven of our team members tried to take on the challenge of going up against the R7000, with streaming HD videos, playing HD online MMORPG games and transferring heavy files. The result? The router won hands down. One of the best features of the R7000 is the open source compatibility. The customization that you will get from open source software lets you completely customize the settings on your router, giving you better performance and security. Speaking of security, the OpenVPN not only supplies you with a VPN, but it has an app, so you can access this router remotely. This is a great feature if you are out of town, or if you are out of the house, but someone else is there. Don’t worry though, not just anyone will be able to connect to your network. There is an access control feature with this router that ensures any device and user has been permitted to connect to the WiFi. Even if someone has the password for your router, they will not be granted access to your WiFi unless you manually go in and allow the device. For a higher performing router, you can’t go wrong with the Linksys Max-Stream EA9300. This impressive Tri-Band home system is a great choice for households that have multiple streaming devices that will be used at the same time. ​With the 6 antennae, this router is a bit harder to conceal than other routers, but the performance value is worth it. Its design is slim and chic, so it will not be an eye sore even when visible. To us, the design almost looks like a landing pad for Queen Amidala to land her ship on. It comes with 5 Gigabit Ethernet ports, one USB 3.0 and one USB 2.0, giving you plenty of options for connectivity. If you’re looking for performance, this router will give you what you are looking for. The Linksys Max-Stream EA9300 is packed full of everything you need for a household that streams multiple devices. With Next-gen MU-MIMO, your gaming will not be interrupted or buffered, keeping you going as long as you need to. The BlueGadgetTooth team went on a gaming frenzy. Imagine a group of people, all playing World of Warships. None of us faced any lagging, buffering of any kind – so we never had any excuse when we failed in battle. The 5 Gigabit Ethernet ports will give you wired speeds that are 10 times faster than standard Ethernet ports. They are ideal for gaming, HD TVs, and any other new technology that needs to have as much power and performance as possible. The setup is simple and quick, taking less than 20 minutes from start to finish. Make sure that you are using the appropriate cables in the appropriate ports or you might find yourself annoyed at the results. The range that you will get from this router is excellent. You should have no problems getting a signal from anywhere in or even outside of your house. The Linksys Smart WiFi allows the connection to be strong, which is also helped by the 6 antennae that send the signal every direction you want, preventing any dead spots throughout the house. Even if you are working with a budget, you should be able to get the best router for AT&T U-verse you can. On a budget, you should consider the Motorola MR2600. This is a Smart Router that combines high speeds with high tech. With its four antennae, sleek design, the Motorola MR2600 is a flat router that should blend into its surroundings fairly easily. Even though it is featured as our budget friendly option, it is not made out of cheap plastic nor does it use the shiny plastic that is nearly impossible to keep clean. The bottom of the router has plenty of clearance as well, so the router will remain cool. It comes with 4 Gigabit LAN ports that can connect to all of your HDTVs, smartphones, game systems and more. You will also find both USB 3.0 and USB 2.0 ports with this router. The USB 3.0 port has a DLNA media sharing support as well. ​For a budget friendly router, the Motorola MR2600 really delivers. The four antennae provide you with concurrent 4X4 performance for both 5 GHz and 2.4 GHz bands. The speed is excellent and has a broad range to reach anywhere you need it to. The Wave 2 MU-MIMO technology allows you to stream from multiple devices at the same time without lag, making this a great choice for households with gaming and video streaming. You will improve your streaming capabilities with this router. If you live in an area which faces heavy interference or WiFi noise from your neighbours, the MR2600 will be the perfect fit for you. The 5GHz band is strong all throughout our testing grounds, while the 2.4GHz frequency was accessible even in the far reaches of our back yard. But the price tag does come with a few limitations. The router does not offer much in the way of settings and customizations. Another budget friendly router that works well with the AT&T U-verse is the TP-Link AC1750 Smart Router. This is proof that quality routers do not need to cost an arm and a leg. ​The design of the Archer A7 includes three external and three internal high-gain antennae, increasing your Wi-Fi signal to reach every corner of your home. It has a plethora of features like the dual USB ports, Powerful CPU, 2 x Guest networks on both frequencies and simple set up process via the Tether app. ​Performance-wise, you will not be disappointed with the Archer A7. It will help out in households especially that have been competing over the bandwidth. The dual band speeds can reach up to 1750 Mbps, providing 3X faster Wi-Fi than other traditional routers do. For heavy-streaming households, the Archer A7 should be able to stream in 4K without any issue. The Archer A7 is designed to boost signal throughout homes up to 2500 square feet, which should work for most of us out there. (It did work for the BlueGadgetTooth team). In some cases, you might still find that you have a signal even when you are outside. Hooray! An added perk, there is a TP-Link app that will allow you to access the Archer A7 even when you are not at home. This allows you to adjust any settings or security concerns that you might have remotely. When you get the Archer A7, you will not be disappointed by how easy it is to install and setup. It comes with instructions and a setup wizard to guide you effortlessly through the process. If you are looking for more of a modern mesh system for an additional router with AT&T U-verse, check out the Google WiFi system. This is a different setup than most routers, but you will not be disappointed. ​The gleaming white three WiFi points almost look like they should have some sort of cakes hidden inside. What we love about the design is that it deviates from the standard alien shapes that most other router manufacturers tend to stick to. The Google WiFi System comes with three WiFi points to be placed in dead spots around your household. You also have the option to purchase more points if these 3 pack Wifi points are not adequate to meet your needs. The sleek and easily concealable appearance makes it easy for you to place it unobtrusively anywhere in your home. These have no visible antennae that you might try to otherwise hide, making them attractive and functional. ​With a single WiFi point, the WiFi system covers up to 1,500 square feet, so with the three combined, you will get coverage up to 4,500 square feet. The more WiFi points that you have, the better range you will get. If you have a larger space, you can always get more points to extend the coverage even further. The Google WiFi system has a simple setup using their app. The app also works to control who and what is connected to your network, including pausing children’s devices. The settings allow for prioritized coverage, so the devices that need the most signal will continue to receive it as needed. The devices act as LAN ports as well as WiFi points, so you will have 2 Gigabit Ethernet ports per point. What this means is that wherever you place the point, you can wire in a device if you need to. This is essential for spaces where you have more than one device that needs to be wired in to function. Perhaps what we loved about the Google WiFi system (apart from the design), is the sheer coverage it delivered. In addition to that, the Network Assist feature ensured that all connected devices were assigned to the best band possible for accessing better speeds. Having too many smart devices hardwired in can confuse the system and drop connections. You do not have to settle for the built-in router that you get from the AT&T modem. Instead, you can improve your range and signal by getting a separate router. This means that you have an opportunity to buy the best router for AT&T U-verse. Our Editor’s choice is the Netgear R7000 Nighthawk. Netgear is well-known for its reliability as well as its open source capability. If you have many smart devices in your home, you might not get from you need from Nighthawk, but there are many other power boosting options out there, like the Google WiFi system which can make poor coverage a thing of the past.